Leeds quartet Pulled Apart By Horses would like to invite you to drink their Blood to celebrate the release of their third album and first ever live acoustic set. The band have teamed up with the West Yorkshire Revolutions Brewery to concoct their own unique pale ale made with Blood Oranges and Yorkshire Tea. The beer will be available for a limited time at specialist pubs throughout the UK. Named after their forthcoming record, Blood will be launched at The Brudenell Social Club on 29 August 2014 with tickets only available to competition winners who post a photo on Twitter and Instagram of them enjoying their favourite drink with the hashtag #PABHsBlood. The best shots will win a pair of tickets to come to the band’s very first acoustic show – over 18’s only. The descision to accompany the ale launch with their first ever acoustic show follows a session they did recently while in The Netherlands, trying their hand at a fully stripped back set up for the first time. With just over a month until the release of their highly anticipated third record, Pulled Apart By Horses have revealed the video for new single Lizard Baby. “The glaringly colourful video for Lizard Baby is a visual juxtaposition of us playing, as we love to do, with some weird and wonderful ideas we came up with when collaborating with director Stephen Agnew (Drenge/The Cribs etc. ),” explained guitarist James Brown. A three minute hypnotic rock sleaze fest, Lizard Baby is the follow up to Hot Squash which received amazing responses, spent four weeks on the Radio 1 playlist and caused the NME to proclaim: “Pulled Apart By Horses are now a serious rock band”. These two teasers from their new album Blood demonstrate the new musical and lyrical maturity the band have achieved since their last release. Pulled Apart By Horses play a series of warm up shows across the country, preparing for their main stage Reading and Leeds Festival slots. They will also be playing a string European dates, supported by Dinosaur Pile-UP for Dr. Martens’ #STANDFORSOMETHING Tour. Fans can enter to win a pair of tickets for the Paris show at www.drmartens.com/uk/Gig-Competition. Pulled Apart By Horses have announced details of the next release to be taken from their hotly anticipated third album Blood. Lizard Baby, which received it’s premiere on Radio 1 as Zane Lowe’s Hottest Record last night, is out on September 1 on the band’s own label Best of the Best through Sony Red. A three minute hypnotic rock sleaze fest, Lizard Baby is the follow up to Hot Squash which received amazing responses, spent four weeks on the Radio 1 playlist and caused the NME to proclaim, “Pulled Apart By Horses are now a serious rock band”. Of the new track, Q said “…this time around they’ve slowed down their schtick to a stoner-rock chug on this snarling gem.” These two teasers from their new album Blood demonstrate the new musical and lyrical maturity the band have achieved since their last release. Pulled Apart By Horses have also just confirmed some new regional UK dates in addition to their European dates for Dr Martins and main stage Reading and Leeds Festival slots. Having ventured to the far corners of the UK over the last few weeks, breaking ceilings and leaving a trail of sweaty, delighted fans in their wake, Pulled Apart By Horses have finally confirmed details of their plans for 2014. Their brand new single Hot Squash, which is out on 23 June, received it’s debut Radio 1 play this week as the ‘Hottest Record In The World’ on Zane Lowe’s show. The track was mixed by Rich Costey (Muse/Foo Fighters/Mastodon/The Mars Volta) and is the opening song on the band’s forthcoming third album Blood out 1 September 2014. The follow up to 2012’s Tough Love, it was recorded in the band’s hometown of Leeds with producer Matt Peel (Eagulls) and will be released on their new label Best of the Best through Sony/RED. As well as appearances over the last few weeks at The Great Escape, Live at Leeds and YO1 in York the band are confirmed to play the main stage at Reading and Leeds Festival later this summer. Pulled Apart By Horses are Tom Hudson (vocals/guitar), James Brown (guitar), Lee Vincent (Drums) and Robert Lee (bass). 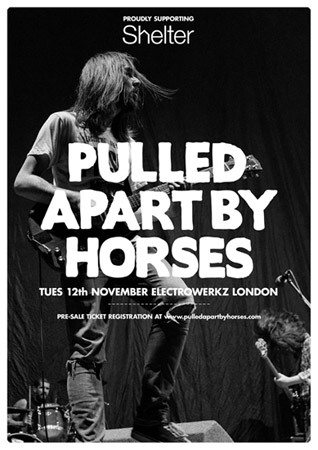 After whetting appetites by showcasing new material at an intimate charity show late last year, Pulled Apart By Horses announce an extensive UK tour for this Spring – their first since February 2012. The dates will see the band journey the width and breadth of the country, playing their new material to fans at special small shows in the lesser-toured parts of Great Britain. 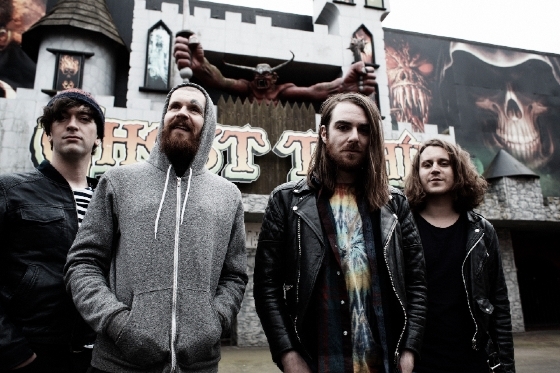 More information on Pulled Apart By Horses’ third album is to follow soon. 25 Dundee Beat Generator Live!